Celebrating the 50th anniversary of Odessey and Oracle, their 1968 masterpiece, the Zombies took fans on a jubilant "odessey" through their catalogue, with two sets that beautifully explored the various chapters of their career. 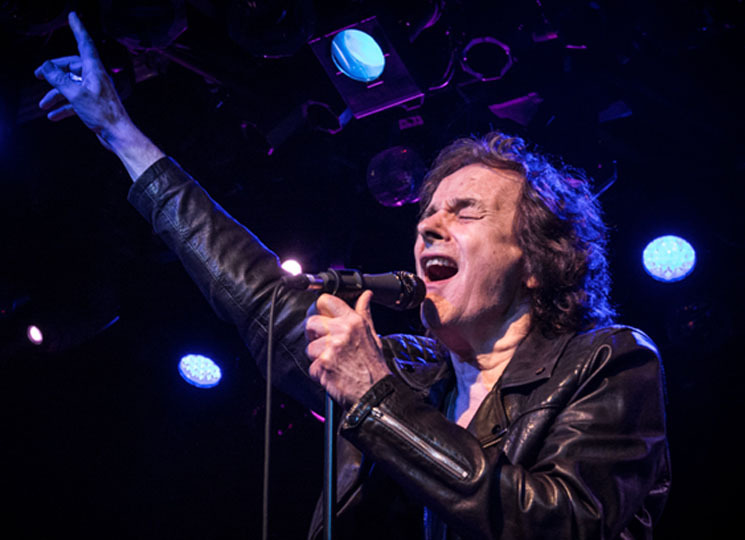 The first, peppered with sentimental anecdotes from Colin Blunstone and keyboardist Rod Argent, featured the band's current lineup (bassist Jim Rodford — also a former bassist for the Kinks and founding member of Argent — guitarist Tom Toomey, and drummer Steve Rodford) and masterfully spanned half a century. The band played early 1960s singles like "Tell Her No" and "She's Not There," alongside covers of the Miracles' "You Really Got A Hold On Me" and Bo Diddley's "Road Runner," which was given a rollicking treatment. "Edge of the Rainbow," from the Zombies' 2015 album Still Got That Hunger, was a highlight, with its melody driven by Argent's dancing keys and Blunstone's sweet cadence. Blunstone's voice was absolutely glorious throughout the evening — he belted robustly, holding his arms out to the audience as he reached for high notes with no falter. Argent's work on the keys was equally awe-inspiring, especially when he descended into solos, as he did on the band's epic rendition of "Hold Your Head Up," from his eponymous 1970s solo project. The second portion of the show was saved for Odessey. After the Zombies were re-introduced to the stage (now with original drummer Hugh Grundy and original bassist — one of the Zombies' most important songwriters — Chris White in tow), the band played the album in its entirety without a pause or banter, letting the music speak for itself. Every note was reproduced, brilliantly breathing Odessey's swirling and romantic narrative to life in its live iteration. "Care of Cell 44" was euphoric; Blunstone's voice was softly tender as he recounted William Faulkner's tragedy on "A Rose for Emily"; the subtle melodic and musical nuances of "Brief Candles" were particularly enriched — a highpoint of the evening, with bright key work from Argent and accompanying keyboardist Darian Sahanaja. The band's harmonies, though consistently striking, were exceptional and choral-like on "Changes," a track that elicited some of the biggest cheers of the night. "Butcher's Tale (Western Front 1914)" saw White take his only lead vocal for the band and, on a blacked-out stage except for a spotlight on the bassist, White's compelling performance captured the song's anxious wartime commentary. "Time of the Season," Odessey's final track and the band's biggest hit, was simply magnificent on all counts. The evening didn't end there, though — after the song's last chord gave way to an enthusiastic and extended ovation from the audience, a freewheeling reprise of "She's Not There" emphasized the enormous musical genius of all the band members and demonstrated that the Zombies are, indeed, more alive than ever. Pick up a copy of Odessey and Oracle on vinyl here.